When you look back at listings you’ve sold in the past you probably wouldn’t be able to credit just one of your activities as THE reason your listing sold. Maybe one had great pictures, another had a terrific open house or maybe someone just drove by and saw it… so many variables to consider when evaluating what works. But there is always one reason that stays the same – a Selling Agent showed your listing to the buyer. 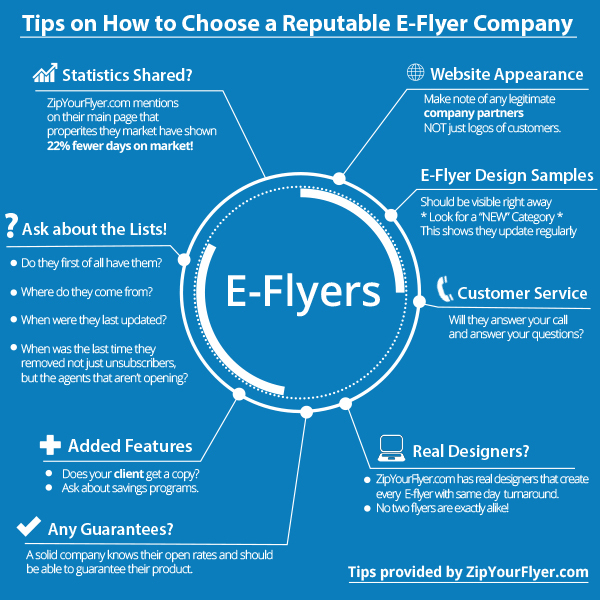 E-Flyers are a terrific way to be sure other agents know about your listing. Of course, most good agents review new listings as they come up on the MLS. Maybe the agent with your perfect buyer doesn’t review new listings regularly, or your listing’s main photo didn’t grab them, or your listing was slightly out of their search parameters. There are so many reasons for your listing to accidentally get passed by and excluded from their searches, while it might be just what their buyer is looking for. Sending an E-flyer presents your listing to other agents the way you want it to be seen. Maybe the brand-new kitchen should be the focus, or a terrific view or the large yard. E-flyers let you showcase the best features of your listing and grab the attention of other agents. Choosing the right E-flyer Company then becomes the challenge. There are many questions to consider to really be sure you are getting what you pay for and that you are represented in a professional way to your fellow agents. As the nationwide leader in real estate E-flyers, sending millions of E-flyers per day, we want to share some valuable tips and resources with the real estate community. As an agent-founded business, we understand the needs of agents and we set out to prove what we already knew… E-flyers do work! We took 6 major cities across the nation in a given time period and found that properties marketed by Zip Your Flyer showed 22% fewer days on market. This is key, getting out there in front of other agents matters! Make sure you determine which pricing model is right for you. Do you want to join a model where you pay a monthly fee or commit to purchasing a certain number of email flyers throughout the year? Agents pay monthly for so many products, Zip Your Flyer feels that E-flyers should truly be a service you only pay for when you have a listing and whenever you need an E-flyer. Customer Service is a phrase that gets used a lot. It is always refreshing to be connected to a Customer Service Representative right away. Doesn’t happen too much these days. It should be easy to call a company and get quick answers to your questions or concerns. Real customer service, and real designers are an integral part of your experience to ensure your professionalism is carried through in your marketing. With the right company, E-flyers are a professional way to get your listing out in front of agents.